The Pittsburgh Pirates had an offensive explosion, tallying six hits in an electrifying 3-2 win over the even-worse Chicago Cubs on Tuesday at PNC Park. Garrett Jones led the way with a solo shot, his second in as many nights against the Cubbies, and Neil Walker continued to swing a hot bat by knocking in the Bucs' other two runs with his first career homer. Lastings Milledge chipped in with a double that he unsuccessfully tried to stretch into a triple, negating a fourth run that would've crossed home. But a Pirate game isn't a Pirate game without a baserunning gaffe. 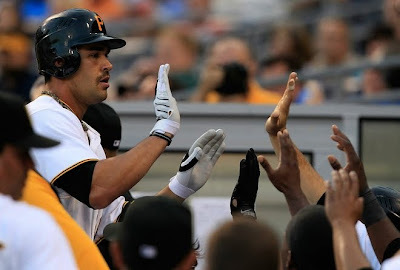 Xavier Nady lit up Pirates pitching for four hits, including a double and two-run home run, but Jeff Karstens held Chicago to two runs over six innings for his second W of the season. Always keeping it interesting, John Russell threw out an inexplicable Pirate lineup that had Milledge in the three-hole, a spot normally reserved for the team's best hitter, and the weak-hitting Bobby Crosby batting fifth. But I don't ask questions anymore, I just shake my head in disbelief when this lineup brings back a win. I'm guessing the Cubs do, too. “Here we have a Pennsylvania team, a state team in Pennsylvania, plus the more revenue that they bring in-the longer they stay in those playoffs-they bring more revenues and it alleviates the tax burdens on the people in Allegheny County as well as Pennsylvania," Drozd told John Seibel and Joe Starkey on Tuesday. The Pittsburgh Penguins, always on the cutting edge, will hold the first-ever "Student Flush" on June 10 at the Consol Energy Center. What is the Student Flush, you ask? It's going to be a simultaneous flushing of all the toilets in the new building, performed by 250 students. The purpose of the event is to test all the toilets and urinals to confirm that the pumps can handle the water flow. Howard Baldwin, the former owner of the Hartford Whalers and later the Penguins, is trying to bring NHL hockey back to Hartford, which it abandoned in 1997 for Carolina. And speaking of food, Big Mama's restaurant on Liberty Avenue was featured by virtually every media outlet in town on Tuesday with the news that she may close her popular spot due to more than $3,000 in parking tickets. She has received tickets ranging from $16 for parking too far in front of a parking meter on Liberty Avenue, to $94.50 for parking in a no-parking zone. Her Land Rover has been "booted" and other cars her family-run business uses were towed. It often takes Franklin, who said she suffers from torn rotator cuffs, more than 15 minutes to unload up to a dozen 40-pound boxes of chicken and ribs when she arrives to work around 8 a.m. She has been ticketed more than once while unloading. "I'm running around like a chicken with my head cut off, trying to figure out how I'm going to pay my rent," Franklin said. "I've been trying to hold on and maintain. But they've been making it impossible." Herb Pope, the Aliquippa product and Seton Hall Pirate who declared for the NBA Draft but withdrew in May, was recently released from the hospital after a collapse caused him to have a one-month stay. Perfect transition for Strasburg from AAA to AAAA before facing a real MLB lineup. What's the record for strikeouts for a starting pitcher's debut? A better question is how many hits will Neil Walker have against him before he gets pulled. All it took for Walker to get promoted was 'AKI' going to the bottom and Walker to get passed over on the lack of hustle on an infield fly. As for the council member, I may move to his district to vote against him. While I agree that the parking situation downtown is rough, you don't get $3000 in fines by occasionally getting caught in a loading zone. You get $3000 worth of tickets by being a scofflaw. She claims that the fines are endangering her business. The same article then said the tickets were on her Range Rover. Sounds like business is really hurtin'. Maybe I'd feel bad if they said they were on her Kia. Matt Drozd = Douche bag! Yes, rooting for Philly makes sense because PA politics has taught us that we all have to think about the greater good. It's like when Rendell fought tooth and nail for the Pens to stay in Pittsburgh. Or, like when all the state politicians stepped in to emphasize the importance of renewing the Pitt-Penn State rivalry. Now that I think about it, it makes so much sense! WTF? How do you get $3,000 in parking tickets before figuring out that you shouldn't park there? Who the hell runs a restaurant and doesn't have their fridge and coolers stocked for the day so that they don't "have to run out and get 40 pounds of chicken"? Not to mention, if you're having so much trouble making the rent payment, maybe you should downgrade from a Land Rover for your vehicle. However, maybe if she sold the freakin Land Rover she could pay off the tickets! What, no Toilet Flushers Local 495 union complaints? The electrical workers union will walk out of a job and picket if someone even changes a lightbulb. Not one cry of "DEY TUK R JOBS!" What's Picksburgh coming to?